This tutorial shows how to enable SSL support for Apache Tomcat web server. To install and configure SSL support on Tomcat, you need to follow these simple steps. 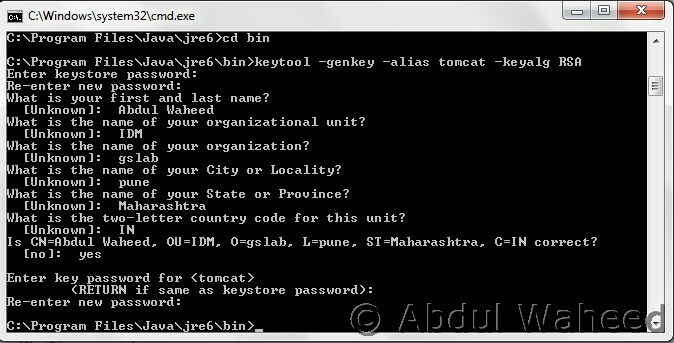 *) Type “keytool –genkey –alias tomcat –keyalg RSA" and press Enter. Where tomcat is an alias name and RSA is a key algorithm. *) Type your password for the keystore. (Default password is: changeit). In this example, I’ll use password as “password"
Enter general information about this Certificate. The example is the image below. In the last line, Enter key password for (tomcat) should be the same as you enter before.Note that this information will be displayed to users who attempt to access a secure page. I have copied the .keystore file and placed in tomcat folder. don’t have to add this attribute. *) Save and restart Apache Tomcat service.